Growing up and still to this day, peanut butter and chocolate is one of my favorite combinations. 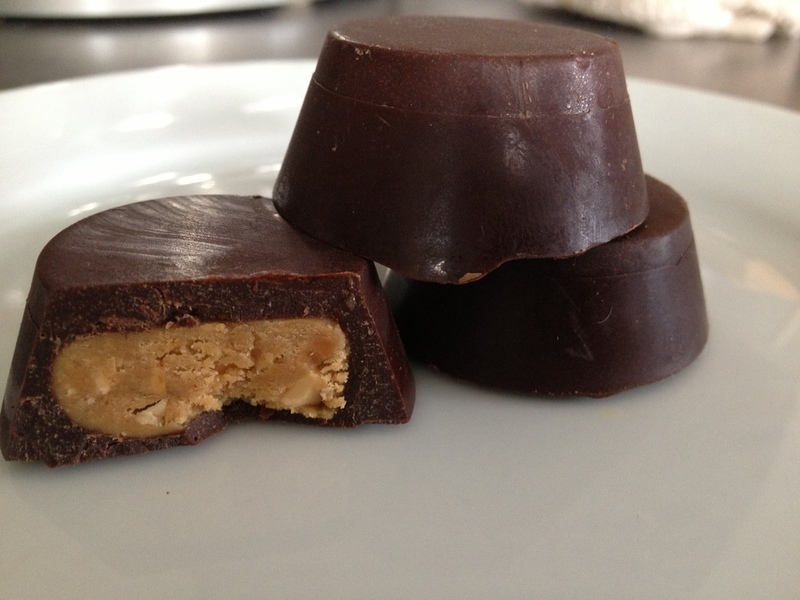 Reese's peanut butter cups were one of my favorite sweet treats that I could eat every day. Unfortunately, they are filled with mostly refined products that likely cause many cavities as a young child. This weekend, I was feeling creative and thought I'd whip up my own version. The end result was spot on and enjoyed thoroughly by myself and the family, as well as attendees of the MOFGA event I was catering. The recipe below will make about 24 1 ounce cups with likely a bit more chocolate leftover. First, stir the peanut butter really well so that the oil is fully incorporated. If not, they can leak thru the finished product. Next, stir together the sweetener and mesquite. Once combined, set aside. Using a 1 oz mold, or foil cups, add 1 tsp of the prepared chocolate then place in the freezer to set. Add a small ball (about 1.5 tsp) of peanut butter to each mold and press down to fill the mold just shy of the sides. Freeze for 10 minutes. Fill the cups just over the peanut mixture then freeze again until set. What's your favorite childhood "candy" and have you been able to find a healthy option?